Scientists have implicated a type of stem cell in the calcification of blood vessels that is common in patients with chronic kidney disease. The research will guide future studies into ways to block minerals from building up inside blood vessels and exacerbating atherosclerosis, the hardening of the arteries. The study, led by researchers at Washington University School of Medicine in St. Louis, appears Sept. 8 in the journal Cell Stem Cell. 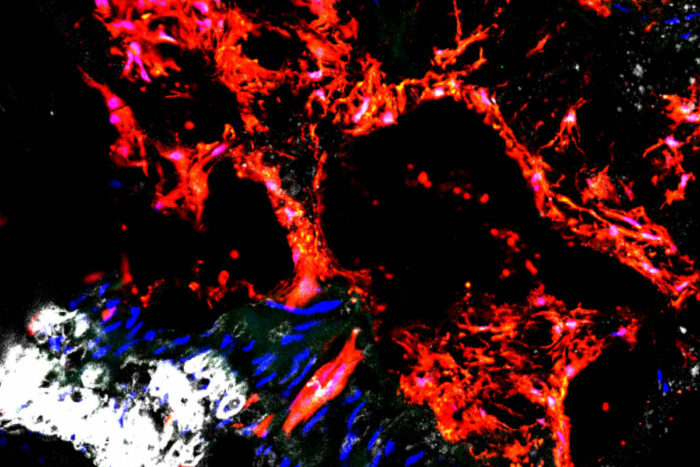 The cells implicated in clogging up blood vessels with mineral deposits live in the outer layer of arteries and are called Gli1 positive stem cells, according to the study. Because they are adult stem cells, Gli1 cells have the potential to become different types of connective tissues, including smooth muscle, fat and bone. Humphreys and his colleagues showed that in healthy conditions, Gli1 cells play an important role in healing damaged blood vessels by becoming new smooth muscle cells, which give arteries their ability to contract. But with chronic kidney disease, these cells likely receive confusing signals and instead become a type of bone-building cell called an osteoblast, which is responsible for depositing calcium. The researchers also studied donated tissue from patients who died of kidney failure and who showed calcification in the aorta, the body’s largest artery. About 20 million adults in the U.S. have some degree of chronic kidney disease, according to the Centers for Disease Control and Prevention. But most of these patients never develop late-stage kidney failure that requires dialysis or kidney transplantation because they succumb to cardiovascular disease first, Humphreys said. The buildup of plaque in the arteries that is characteristic of cardiovascular disease is worsened in patients with diseased kidneys because of the additional mineral deposits. Further supporting the argument that Gli1 cells are driving the calcification process, Humphreys and his colleagues showed that removing these cells from adult mice prevented the formation of calcium in their blood vessels. Humphreys is continuing to focus on the kidney in studying ways to guide Gli1 cells away from bone-building osteoblasts and toward vessel-healing smooth muscle cells. Kramann, who is now at Aachen University in Germany, is studying the same process with a focus on the heart. This work was supported by the German Research Foundation, grant number KR-4073/3-1; the European Research Council, grant number ERC-StG 677448; a START Grant from the RWTH Aachen University (101/15); the State of North Rhine-Westphalia; the National Institutes of Health (NIH), grant numbers DK088923, DK103740, DK103050, P30 CA91842 and UL1 TR000448; and the American Heart Association, grant number EIA14650059. Kramann R, Goettsch C, Wongboonsin J, Iwata H, Schneider RK, Kuppe C, Kaesler N, Chang-Panesso M, Machado FG, Gratwohl S, Madhurima K, Hutcheson JD, Jain S, Aikawa E, Humphreys BD. Adventitial MSC-like cells are progenitors of vascular smooth muscle cells and drive vascular calcification in chronic kidney disease. Cell Stem Cell. Sept. 8, 2016.